Every incredible developer has their humble beginnings. Nintendo had Mario Bros. and the Legend of Zelda. Sega had Sonic the Hedgehog and Alex Kidd. Even lesser known companies than those like Konami and Capcom have their beginnings. Then, there are niche developers that have interesting beginnings that one wouldn’t expect. Take Atlus, for example, who is well-known by many gamers as the purveyors of games like Persona, Shin Megami Tensei, and various other interesting titles. 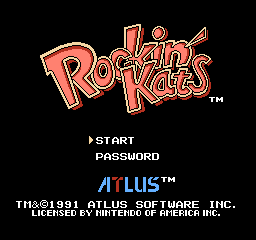 One of their four games for the NES, Rockin’ Kats, is much more mainstream than their position now would have one assume. No demons or crucifixions here. Just good clean fun. All right, so we have this little title here, where New York City has been taken over by, as you may have guessed already, dogs. One dog in particular, Mugsy, has been a thorn in the side of Willy, an upcoming and coming jazz performer who goes by the name of ‘The Rockin Kat’. When Mugsy kidnaps his girlfriend, a hot little number named Jill, Willy decides to take matters into his own hands and save her. Through five different channels- what the game uses for levels- Willy will punch, jump, and swing his way through hordes of enemies to save his girlfriend and his city. The game’s idea is simple: make your way through each level, go through the final level, and defeat Mugsy. It’s the intricacies of the game that score it points. As you go through the levels, you collect money to spend on the Shopping Channel, on of the two optional channels that lets you buy power-ups and extra lives, or the Bonus Channel, where you can play mini-games to earn more money. Y’know, to spend on the Shopping Channel. Honestly, if you get good enough at the pipe toss, you can spend fifteen minutes there and be set for the rest of the game with power ups and lives. Each level has a few zones, a mid-boss, and a final boss, all of which can prove to be more challenging than the game’s exterior would imply. Mastering Willy’s punch gun is not just important- it’s essential. Not only can you punch out enemies, but you can use the gun to grab onto overhanging pipes or ledges to swing from, hold the punch button down to create an open hand to grab items with which to throw at enemies, or punch the ground in mid-air to launch yourself into a sort of extended double jump. Add in the power ups that let you hit harder, throw bombs, or shoot twin balls from your glove (not to mention the ‘Jet Sneakers’, which let you hover for a short time during your jump and I found incredibly useful), and you’ve got a whole slew of things to customize your playthrough. What makes this game stand out amongst its platformer brethren? Well, for the most part, it’s the challenge that it offers. 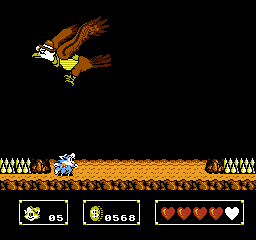 The game really is one of those ‘only on the NES’ difficult games. 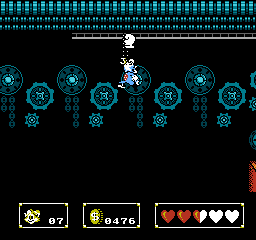 Maneuvering in mid-air, changing weapons three or four times throughout the level, as you can only use one at a time, and stronger than average bosses are par for the cours e here. Factor in the fact that once you actually complete the game and save Jill, a total number of five times, Mugsy invites you to battle him on a more difficult stretch of terrain without any money or power-ups. Mario was tough, but Rockin’ Kats brings a new meaning to the word ‘challenge’ so far as platform games are concerned. Thankfully, the game has a password function, and the continue process only brings you back to the beginning of the level when you lose all of your lives. In fact, for such a challenging game, Rockin’ Kats is also very forgiving. There are plenty of extra lives strewn about, for those willing to take the extra leap to get to them, as well as health refreshers, and dying doesn’t take you too far back into the level as each zone is relatively short. Whereas some games of this time became tedious or so aggravating that you didn’t want to pick them up again, Rockin’ Kats finds a way to continue being fun, even when you’re dying over and over again. That’s all well and good, but now for the bad parts of the game. It’s hard to screw up a platform game, and Atlus did a fine job with constructing this one. The worst complaint is the wonky physics in the game. In certain situations, the punch gun doesn’t react as quickly as one would like or expects, resulting in missed grabs and lost lives sometimes. Not to mention that some of the enemies simply disappear when they go slightly off screen, while some reappear if you back track a step too far, again resulting in unexpected hits and lost lives. Long and short, the game suffers from weird technical difficulties, though once you get the hang of those, it’s easy enough to continue on without much hassle. In a technical aspect, though, the front end is well off enough. The game’s music doesn’t stand out as great or terrible. The ending music is the only music that comes off as memorable at all, though, the theme from ‘Downtown’ will be stuck in your head for a while. A lot of the music is used over again in different parts of the game, most noticeable being the graveyard and the cavern areas use similar, if not the exact same, music. It is jaunty, though, and a lot of the music the player experiences has a nice jazzy feel to it. The sound effects lend a cartoon feel to the game that is strengthened by its visuals and comic book tones in its ‘cut scenes’. The graphics are decent. ‘Perfectly average’ may be the correct term to use here. While not astounding, the graphics are pleasant and crisp. No deformed characters and nothing that can be remembered as being visually offensive. The one complaint may be that, for the most part, boss battles play out in front of a blan k black screen, with few exceptions. While it helps to concentrate on just the boss, it does feel a little lazy. The backgrounds tend to veer toward really interesting and colorful or really plain and boring. While the game is tough, it’s easy to see why it fell into mediocrity. If it weren’t for the tough nature of the game, it would be completely cookie cutter. On the outside, it is, which is probably why few people know the game exists. If you get the chance to pick it up, though, do it. Check it out, as this reviewer has fond memories of hunkering down on a couch with a couple of friends when he was younger and battling their way through it to save New York City. If you like Mario, Sonic, or any of the rest of those, you’ll surely enjoy traveling along with Willy on his adventure. You just probably won’t remember much more than the title and this review when a month or so passes.